Many scientific researchers have shown connections between brain functioning and student learning. But a large number of educators have been frustrated with understanding and interpreting the language, limits and scope of recent neuroscientific findings. As a result, many forward-thinking neuroscientists and educators have been forging ahead with their own parallel sets of understandings and conclusions about brain-education interactions and implications. Here, collaboration is suggested to develop a common language and platform for understanding and implementing the research in schools. Specifically, we need of a common body of governing “brain-based principles” that support our collective understanding of learning in an educational context. Seven initial principles are proposed for discussion and it is hoped that more will be added over time. Brain-based learning means understanding these principles. While the request seems innocent enough, the difficulties with this approach are many. For starters, much of scientific research was done under very narrow constraints and cannot be widely generalized. Schools, by contrast, are far from a fixed environment. They are a run “on the fly” with a varied curriculum, constant staff turnover, unpredictable social and emotional interactions, a wide spectrum of physical buildings, and highly varied inventory (students). The research that educators typically want to draw from is also varied. We might roughly classify the neuroscientific scientific research into three categories: basic, clinical and applied. Basic research is conducted at the micro level. Studies are often done at on molecules, cells, genes, structures and bodily processes which can seem distant to educators. But much of basic research does have relevance to educators. For example, basic neuroscience studies revealed neurogenesis (the production of new neurons) is conserved in humans and that neurogenesis is highly correlated with learning, memory and mood. Clinical research is typically done with animals or humans, often in a university setting. The experiments are likely to be well-controlled and the results more credible. Clinical research studies on neural plasticity in animals led to human studies which eventually led to commercial programs such as FastForward® facial software “Let’s Face It” by Jim Tanaka’s team at Princeton. Applied research is typically done in schools (medical, dental and academic) where the results seem more clear, but there are still issues with demographics, sample size, subject variability, compliance, protocol and generalizability. In many cases, longitudinal studies with large sample sizes may be the only appropriate way to study the effects of a particular strategy or model, but there’s little funding for large-scale, long-term academic studies. Brain-based learning means using this in your contexts. It is clear to both of the stake holders that each of the three research domains listed above has its own limitations. But unless educators understand the theoretical and research basis for any classroom strategy, are they really any better off? Unless they can 1) articulate the research basis of their strategies being used, 2) understand the context, scope and limitations of the research being applied and 3) keep track of what is done and the results in the form of actions taken, are educators any better off than using random strategies? For example, many teachers use a classroom “energizer” assuming that it’ll increase oxygenation and heart rate (including circulation to the brain). But they may be unaware of the varied contexts for the simultaneous release of chemicals such as cortisol, dopamine or norepinephrine that have a wide (and unexpected) range of effects on student cognition or behavior. On the other hand, neuroscientists are grounded in research. Research studies are often fraught with confounding variables that suggest limits on the scope, demographics and certainly on the capacity to generalize the experimental results to widespread application. To a degree, their peers play a part in maintaining an industry-wide standard of quality. Scientists understand experimental design and want to be cautious about making any classroom “translation” of assertions of the data into a teaching strategy. Their profession has taught them well to avoid making any leaps from theory to practice that cannot be justified without further research. And while the NIH and other funding agencies have increased their requests for applied studies, not everything worth studying can or should fall into the “applied” area of study. Each of the two groups (educator and neuroscientist) have different perceptions, different work strategies and different professional needs. What is being proposed is a common ground. Towards this goal, many noted researchers have been fostering interdisciplinary programs (e.g. Kurt Fischer’s degree programs at Harvard, Marc Swartz’s program at UT Dallas). Many forward thinking educators have also developed opportunities for educators and neuroscientists to interact through mind-brain conferences. These events encourage dialog and increased common knowledge. But what’s needed is a philosophical and theoretical bridge. This common ground could consist of a common set of neuroscientific principles that can be understood by the layperson. While one could generate dozens or even hundreds of guiding principles, only ten will be introduced as a starting point. If we generate too few principles, the principles become so generalized, they become functionally useless. Yet, too many principles may become too cumbersome for one to learn and apply them all. Several educational consultants (e.g. Caine and Caine, Kovalik and myself) have already developed lists (from 7-12) of brain-mind principles for our own audiences. No claim is being made that this list is either inclusive, or superiour to any other list of principles. The two claims that are being made here are: 1) there may be some value in the application of these in an educational context versus, and 2) the list may be a useful starting point for discussion to help “bridge” the two professions. While countless principles could have been offered, only principles which appeared to have a significant relevance to educators were chosen. As a starting point, the following seven are being presented for discussion. Brain-based learning starts with principles. Principle: Contrary to the fixed brain theory a few short years ago, brains are not fixed. In fact, they are susceptible to change throughout our lifetime. The changes are driven by myriad of factors. Those factors include experience- dependent changes (nutrition, stressors, exercise, socialization, learning) and experience-independent changes (pruning, maturation, aging). Many changes are the result of gene and environment interactions known as gene expression. In short, our DNA is not 100% of our destiny. When we change, what specifically changes in our own brain? The changes occur at the system levels, organ levels, chemical, cellular and and genetic levels. As an example, our brain activates variations in the production, survival and death of neurons. It will enhance or diminish cell connectivity, cell size, and alter the location of brain activity. Our brain will have fluctuations in specific areas of tissue size, proportions of gray and white matter as well as baseline chemical levels. In short, our brain is a busy cauldron of activity. While some change is a function of everyday living, a significant amount is actually regulated by our lifestyle. This invites enormous opportunity for influence through education or self-regulation. Collorary: While it’s true that random activities can change the brain (e.g. trauma) educators should know that certain purposeful, school-wide or classroom experiences can strategically change the student’s brain. The ability of the brain to rewire and remap itself via neuroplasticity is profound. Schools can influence this process through skill building in areas such as reading, meditation, arts, career preparation, physical activity and thinking skills that can build student success. The evidence is compelling that when the correct skill-building protocol is used educators can make positive and significant changes in the brain in a short period of time. 3-5x per week to upgrade student skill sets. Teach attentional skills, memory skills and processing skills. Progress requires focus, “buy-in” and at least a half hour a day. 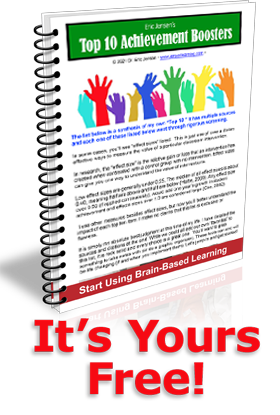 Brain-based learning means you are purposeful about teaching in a brain- friendly way. Cautions: We now know that underperforming students can usually do much better if the school experiences are positive, targeted and sustained. But without understanding the specific “rules” for how our brain changes, educators can waste enormous amounts of time and taxpayer money, and students will still fall through the cracks. Evidence suggests the applied, contrasting skill- building needs applications for 20-90 minutes a day at least three or more times a week to students who “buy-into” the process to show sustained results. Principle: A combination of genetics and life experiences make every human brain as unique as a fingerprint. Of those who responded to the UCLA “healthy brain” student advertisement and considered themselves to be normal, only 32% passed the initial telephone screening process. Of those who qualified for the in-person health history and physical examinations, only 52% passed these screening procedures. “The majority of individuals who consider themselves normal by self-report are found not to be so.” Let me repeat: almost 90% of human brains are atypical, damaged or in some way not healthy. That does NOT mean that many students have not compensated; they have. Connections for Educators: This principle says much more than “One size does not fit all” or that “differentiation is a good idea. This is a profound understanding that tells us the entire educational model is outdated. For decades, educators were told that there is a large body (80-95%) of “mainstream” kids who were normal or typical. The remaining students were identified as “outliers” and typically classified as gifted, behavior disordered or requiring special education. This model does not match up with the scientific data on brain variations. What is more accurate to say is, “We have significant variation in the large majority of our students (80-95%) and the remaining “outliers” have what we call a typical or “healthy” brain. Brain-based learning means respecting uniqueness by using variety and choice in the teaching process. Cautions: While the political and educational implications of this are enormous, it is unknown to what degree this should shape policy. Certain schools expend a significant amount of resources (time, money and policymaking) to socialize students into “sameness” such as private prep schools, military schools, parochial schools and selected public schools. To the degree that these schools succeed, students many become more alike in their behaviors. Yet, on the whole, we are unique beings with a unique set of beliefs, experience, knowledge and actions. Schools that can engage students via their differences can meet needs better. Principle: We could categorize student learning (information, values or skills, etc.) in many ways. One way to group it would be to answer the question: “Was the knowledge “actively constructed” or “transferred” to you? The human brain is designed for interactive learning. The human being is more helpless at birth than most other mammals. We are born more than “open” to environmental input; we require it to develop our brain properly. Without interactive visual, auditory and tactile input, our systems misfire and underperform. But our brains are designed to actively manage our experiences, not passively “download” them. Useful, practical, functional knowledge is based in activity not passivity (Singer, 1995). While it has the capacity for a “sit and git” experience in a classroom memorizing numbers, poems, facts and geography lessons, this declarative capacity may be the weakest of all the brain’s learning systems. In fact, we cannot talk about the interface between the brain and learning or the brain and the environment as if these are isolated variables. For our brain, interactive learning experiences in a relevant environment are processed in far differently and more potent ways than sitting in a classroom and reading or memorizing a text. At school, beginning in the middle and upper elementary grades (ages 8 and above) there is an increasing percentage of students being asked to sit “still and learn.” Brain-based learning means you orchestrate learning in ways that allow students to piece together the learning. Cognitive and Neuroscience. When animals and people do things in their worlds, they shape their behavior. Based on brain research, we know that likewise they literally shape the anatomy and physiology of their brains (and bod- ies). When we are simply exposed to events and information learning and teaching require active construction of knowledge, as research has demonstrated consistently in cognitive science for over a century (Baldwin, 1894; Bartlett, 1932; Piaget, 1952) and in neuroscience for 50 years (Singer, 1995). The conduit metaphor works to some degree for learning bits of information, but for using knowl- edge instead of reciting facts, cognitive and neuroscientists are replacing the conduit metaphor with a model of knowl- edge as actively constructed. People build knowledge by using it actively to do things in the world. For example, Piaget’s (1952) fundamental metaphor for knowledge is grasping ideas and facts with the mind and manipulating them physically and mentally. The first premise is that the emerging field of brain-based education needs a broader platform on which further work can be built. Many neuroscientists are unfamiliar with the demands faced by everyday classroom teachers, working with students age 6-17. Correspondingly, most educators lack the technical background to understand journal articles and create well-designed experiments what would yield useful data. Yet we must learn to understand each other and have a common vehicle with which we can move forward. This article has suggested the potential value of a set of brain-based principles. It is the author’s view that these principles could be reviewed and refined in open forum ways similar to a Wikipedia posting process. Ultimately, these principles can be shared on websites and journals as a common platform for both educators and neuroscientists. Further discussion, insights and commentary will refine and update the proposed principles as both collegial insights and new research warrants. Social conditions influence our brain in multiple ways we never knew before. Today, sociology is now influenced by the journal of Social Neuroscience. The student experience at school is a highly social experiences, which become encoded through our perceptual awareness which may encode our sense of reward, acceptance, pain, reciprocity, affinity and cooperation. Neuroscience Connections. Isolation and poor social conditions, isolation or social “defeat” are correlated with fewer brain cells! Nobody knew this occurred five or ten years ago. Educational connections: Do NOT allow random social groupings for more than 10-20% of the school day. Use targeted, planned, diverse social groupings with mentoring, teams and buddy systems. Work to strengthen pro-social conditions. Teacher-to-student relationships matter, as do student-to-student relationships. Our brains, bodies and minds are intricately connected. Physical activity, recess and movement are critical to education. Why? We now know that we can grow new neurons through our lifetime and that they are highly correlated with memory, mood and learning. This process can be regulated by our everyday behaviors, which include exercise. The optimal activity is voluntary gross motor, such as power walks, games, running, dance, aerobics, team sports and swimming. Neuroscience Connections. We also now know that early childhood movement wires up the brain to make more efficient connections. That supports the later academic learning. Schools can and should influence these variables. Educational connections: Educators ought to be encouraged to support more, not less physical activity. It raises the good chemicals for thinking, focus, learning and memory (noradrenaline, dopamine and cortisol). Students need 30-60 minutes per day to lower stress response, boost neurogenesis and boost learning. Bruel-Jungerman E, Laroche S, Rampon C.(2005) Eur J Neurosci. New neurons in the dentate gyrus are involved in the expression of enhanced long- term memory following environmental enrichment. Jan;21(2):513-21. Kirk I. Erickson, Ruchika S. Prakash, Michelle W. Voss, Laura Chaddock, Liang Hu, Katherine S. Morris, Siobhan M. White, Thomas R. Wójcicki, Edward McAuley, Arthur F. Kramer. Aerobic fitness is associated with hippocampal volume. Hippocampus, 2009. Pereira AC, Huddleston DE, Brickman AM, Sosunov AA, Hen R, McKhann GM, Sloan R, Gage FH, Brown TR, Small SA. (2007) An in vivo correlate of exercise- induced neurogenesis in the adult dentate gyrus. Proc Natl Acad Sci U S A. Mar 27;104(13):5638-43. Ratey, J. (2008) Spark: The revolutionary new science of exercise. Ball K, Edwards JD, Ross LA. (2007) The impact of speed of processing training on cognitive and everyday functions. J Gerontology B Psychology Science Soc Sci.Jun;62 Spec No 1:19-31. Draganski B, Gaser C, Busch V, Schuierer G, Bogdahn U, May A (2004) Neuroplasticity: changes in grey matter induced by training. Nature 427:311–312. Jonides, J. (2008) “Musical Skill and Cognition” Pgs. 11-16. In “How Arts Training Influences Cognition” in “Learning, Arts, and the Brain: The Dana Consortium Report on Arts and Cognition” Organized by: Gazzaniga, M., Edited by Asbury, C. and Rich, B. Published by Dana Press. New York/Washington, D.C. web access: www.dana.org. Polley DB, Steinberg EE, Merzenich MM. (2006) Perceptual learning directs auditory cortical map reorganization through top-down influences.J Neurosci. 2006 May 3;26(18):4970-82. Practical school application: Make differences the rule, not the exception at your school. Validate differences. Never expect all students (4th graders, for instance) to be on the same page in the same book on the same day. That runs counter to an extraordinary research databases that shows variations in maturation rates and other brain differences. Allow kids to celebrate diversity, unique abilities, talents and interests. Give them the skill sets, relationships and hope to succeed. Mazziotta JC, Woods R, Iacoboni M, Sicotte N, Yaden K, Tran M, Bean C, Kaplan J, Toga AW; (2009) The myth of the normal, average human brain–the ICBM experience: (1) subject screening and eligibility. Neuroimage. Feb 1;44(3):914-22. New evidence suggests the value of teaching content in even smaller chunk sizes. Why? Neuroscience Connections. The old thinking was that students could hold seven plus or minus chunks in the head as capacity for working memory. But that science is outdated. The new research says two to four chunks are more realistic. In addition to this shorter capacity for working memory, our mid-term “holding tank” for content, the hippocampus, has a limitation on how much it can hold. It is overloaded quickly, based partly on learner background and subject complexity. There are other reasons our students get overloaded quickly with content. Learning and memory consume physical resources such as glucose and our brain uses this quickly with more intense learning. Practical school application: Teachers should teach in small chunks, process the learning, and then rest the brain. Too much content taught in too small of a time span means the brain cannot process it, so we simply don’t learn it. Breaks, recess and downtime make more sense than content, content and more content. Here’s the guideline: the more background the learner has and the greater the complexity of the content, the shorter the time chunk (use 4-8 minutes). The greater the background knowledge, the less the complexity, the longer the “input” stage (8-15 min.) is acceptable. Under no condition, should there be more than 15 consecutive minutes of content input. Share this with your teachers. But share it in a small chunk, and then allow time for processing it. Gobet F, Clarkson G. (2004) Chunks in expert memory: evidence for the magical number four … or is it two? Memory. 2004 Nov;12(6):732-47. Cowan, N. (2001, Feb). The magical number 4 in short-term memory: A reconsideration of mental storage capacity. The Behavioral and Brain Sciences, 24(1):87-114. The role of the arts in schools continues to be under great scrutiny. But five neuroscience departments at five universities (University of Oregon, Harvard, Univ. of Michigan, Dartmouth, and Stanford) have recently completed projects studying the impact of arts on the brain. Arts and Neuroscience is a new journal that tracks the connections being made by researchers. The recent results suggest that arts are far better than earlier believed. They show that certain arts boost attention, working memory, and visual spatial skills. Other arts such as dance, theater and drama boost social skills, empathy, timing, patience, verbal memory and other transferable life skills. Practical school application: Make arts mandatory and give students the choice of several, support with expert teachers and the time to excel at it. Right now, evidence suggests that you get the most value from 30 to 60 minutes a day three to five days a week. Arts support the development of the brain’s academic operating systems in ways that provide many transferable life skills. Posner, M., Rothbart, MK, Sheese, BK, and Kieras, J. (2008) “How Arts Training Influences Cognition” Pgs. 1-10. in “Learning, Arts, and the Brain: The Dana Consortium Report on Arts and Cognition” Organized by: Gazzaniga, M., Edited by Asbury, C. and Rich, B. Published by Dana Press. New York/Washington, D.C. web access: www.dana.org. Spelke, E. (2008) Effects of Music Instruction on Developing Cognitive Systems. at the Foundations of Mathematics and Science. ” Pgs. 17-50 In “How Arts Training Influences Cognition” in “Learning, Arts, and the Brain: The Dana Consortium Report on Arts and Cognition” Organized by: Gazzaniga, M., Edited by Asbury, C. and Rich, B. Published by Dana Press. New York/Washington, D.C. web access: www.dana.org. Humans have the remarkable capacity to display many emotions, but only six of them are “hard wired” or built in at birth. This is profound because it tells us that unless children get these emotional states taught to them early (ages 0-3), when they enter school, they’ll be emotionally narrow. Kids rarely ever get the emotional skills built in to ready for school. This leads to more discipline problems and weakened cognitive skills in school. This means we’ll have kids at school who do not understand appropriate emotional responses (e.g. cooperation, trust, shame and humility) unless we teach them at school. Most kids are not getting these taught at home. You class should offer quick, daily skill-building with blended-in-daily practice. Otherwise students will misbehave, not understand directions, fail to be respectful to teachers and show no empathy when others are in pain. There are more early childhood kids in day care (60-80%) today compared with 10-12% in two generations ago. This is also profound because out of the possible hundreds of emotional states, only a few are good for learning (e.g. anticipation, curiosity, suspicion, confusion). Most states are, in fact, bad for learning. Practical school application: This suggests two things. One, we must teach appropriate emotional states as life skills (e.g. honor, patience, forgiveness and empathy) and, secondly, it’s important to read and manage the other emotional states in the classroom. In good states, students learn well and behave better. Insist that teachers build social skills into every lesson. Ask that they use the social structures that are advocated in cooperative learning programs every day. The better the social skills, the better the academics. Many good programs are in books, workshops and online. Why put effort into this area? Kids who learn patience, attention, empathy and cooperation will be better students. Duckworth, Angela L.1; Seligman, Martin E.P.1(2005) Self-Discipline Outdoes IQ in Predicting Academic Performance of Adolescents Psychological Science, Volume 16, Number 12, December, pp. 939-944(6). Ekman, P. (2003). Emotions Revealed. New York: Henry Holt and Co. Ostberg V. (2003) Children in classrooms: peer status, status distribution and mental well-being. Soc Sci Med. 2003 Jan;56(1):17-29. Marjoribanks K. (2003) Family and ability correlates of academic achievement: social status group differences. Psychol Rep. 2003 Oct;93(2):419-22. Summers CH, Forster GL, Korzan WJ, Watt MJ, Larson ET, OVerli O, Hoglund E, Ronan PJ, Summers TR, Renner KJ, Greenberg N. (2004) Dynamics and mechanics of social rank reversal. J Comp Physiol A Neuroethol Sens Neural Behav Physiol. Sep 11. There have been stunning strides in rehabilitation of brain-based disorders, including Asperger’s, learning delays, dyslexia, and autism. The discovery that aggressive behavioral therapies, new drugs and revolutionary stem cell implantation can be used to influence, regulate and repair brain-based disorders has been amazing. Now we have the Journal of Rehabilitation and The International Journal of Rehabilitation Research. Psychiatry is now guided by the journal Biological Psychiatry. These journals showcase innovations suggesting special education students may be able to improve far more than we earlier thought. Practical school application: Make sure all teachers (not just special ed) learn the latest in dealing with special education learning delay recovery. Most kids can be brought back into regular ed classes, but not with inclusion-only strategies. It takes consistent hour-a-day skill building or the student won’t change. Learn the right skills and go to it 3-5 days a week. Ball K, Edwards JD, Ross LA. (2007) The impact of speed of processing training on cognitive and everyday functions. J Gerontology B Psychol Sci Soc Sci.Jun;62 Spec No 1:19-31. Draganski B, Gaser C, Kempermann G, Kuhn HG, Winkler J, Büchel C, May A (2006) Temporal and spatial dynamics of brain structure changes during extensive learning. J Neurosci 26:6314–6317. Gaab, N. (2007) Correlates of rapid auditory processing are disrupted in children with developmental dyslexia and ameliorated with training: an fMRI study. Neurological Neuroscience. 25(3-4), 295-310. The recent brain/mind discovery that even memories are not fixed but, instead, are quite malleable is powerful. Every time you retrieve a memory, it goes into a volatile, flex state in which it is temporarily easily re-organized. This is highly relevant for teachers and administrators who are responsible for student learning and classroom testing. Every time students review, they might change their memory (and often do). Yet, without review, they are less likely to recall their learning. It suggests that teachers use several strategies to continually strengthen memory over time instead of assuming that once learned, the memory is preserved. Practical school application: First, teachers should review the content half way between the original learning and the test. If content is taught Monday and tested on Friday, then review should be on Wednesday. Second, teachers should mediate the review process with students through structured reviews such as written quizzes or group work that ensures quality control. Otherwise the material is more likely to get confused and test scores drop. Pashler H, Rohrer D, Cepeda NJ, Carpenter SK. (2007) Enhancing learning and retarding forgetting: choices and consequences. Psychon Bull Rev. Apr;14(2):187-93. Pashler H, et al. (2005) When does feedback facilitate learning of words? J Exp Psychol Learn Mem Cogn. Jan;31(1):3-8. A field has emerged known as “brain-based” education and it has now been well over twenty years since this “connect the dots” approach began. In a nutshell, brain based education says, “Everything we do in education uses our brain; let’s learn more about it and apply that knowledge.” However, this author suggests a new collaborative process which does more than establish connections between brain function and educational practice. We need a common ground on which both educators and neuroscientists can agree. But it is not the job of classroom teachers to understand and formulate. If your question was, “Are the approaches and strategies based on solid research from brain-related disciplines or are they based on myths, a well-meaning mentor teacher or from “junk science?” Now you know the answer. We would expect an educator to be able to support the use of a particular classroom strategy with a scientific reasoning or studies. Each educator ought to be professional enough to say, “Here’s why I do what I do.” I would ask: Is the person actually engaged in using what they know, or simply having knowledge about it, but not actually using it? Are they using strategies based on the science of how our brain works? Brain-based education is about the professionalism of knowing why one strategy is used over another. The science is based on what we know about how our brain works. It’s the professionalism to be research-based in one’s practices. Keep in mind that if you don’t know why you do what you do, it’s less purposeful and less professional. Chronic stress is a very real issue at schools for both staff and students. Recent studies suggest 30-50% of all students fell moderately or greatly stressed every day. Acute and chronic stress is explored in the Journal Stress, the International Journal of Stress Management, the Journal of Anxiety, Stress and The Journal of Traumatic Stress. In some schools, the numbers are double that! For those from poverty, the numbers can be higher. These pathogenic allostatic stress loads are becoming increasingly common and have serious health, learning and behavior risks. This issue affects attendance, memory, social skills and cognition. Some stress is good, chronic or acute stress is very bad for behavior and learning. Practical school application: Teach students better coping skills, increase student perception of choice, build coping skills, strengthen arts, physical activity and mentoring. These activities increase sense of control over one’s life, which lowers stress. All of these can reduce the impact of stressors. Johnston-Brooks, C. H., Lewis, M. A., Evans, G. W., & Whalen, C. K. (1998, Sep-Oct). Chronic stress and illness in children: The role of allostatic load. Psychosomatic Medicine, 60(5):597-603. Koomen, H. M. & Hoeksma, J. B. (2003, Dec). Regulation of emotional security by children after entry to special and regular kindergarten classes. Psychological Reports, 93(3Pt 2):1319-34. In fact, neuroscience is exploding with discoveries about the brain as being highly malleable. We used to think about the paradigm as either genes or experience. We now know it can be a hybrid of both! New journals called Gene Expression, Gene Expression Patterns and Nature Genetics explore the mechanisms for epigenetic (outside of genes) changes. We now know that environments can trigger genes to express themselves in ways we never would have predicted—IF you know what to do. You can upgrade a student’s capacity for memory, processing, sequencing, attention and impulsivity regulation. Why not teach these skills to give students the tools to succeed? The brain changes! Plasticity is a lifelong quality that varies only in degree. The big message here is simple: Brain-based learning means understanding how the brain works and applying it to your work in a positive way. What is the full APA citation data for this article? Jensen, E. (2013). Guiding principles for brain-based education: Building common ground between Neuroscientists and Educators. The emphasis on the necessity of educators understanding the uniqueness of brains is extremely important. This understanding provides insight for models that are incredibly helpful for students such as strength-based approaches that look at the differences in individual brains primarily in terms of traits rather than dysfunction for educational purposes. There may be an opportunity in this discussion, however. Both principles two and six deal with uniqueness. It could be that these could be effectively combined making room for another area that could benefit this discussion. That area is the broad developmental changes taking place in the brain that cause understandable differences in how children learn in their social environments. One obvious developmental period includes the changes that take place in the early development of a young child progressing from primarily downloading information from the surrounding environment (implicit learning) to becoming a more active participant in that learning process (explicit learning). Another obvious period includes the changes that take place in puberty and the significance of the accompanying myelination during this time of life. Students change, becoming being more peer focused, emotionally active, and risk amenable. Changes such as these affect how students learn, and how we most effectively instruct them. To ignore a brain that is being internally pushed toward peer interaction, or toward risky experience, is counterproductive. Yet we often speak of teen behavior as if these changes are odd or negative rather developmentally appropriate and needing support. If this were one of the major principles to be better defined and further developed and explored by scientists and educators, this could provide extremely helpful information to educators as they work with students through differing phases in the developmental continuum. I have used and translated these principles and brain research with the people at my school and the workshops that I have taught. It is a unique and important information for teachers and staff developers. I have recently created a workshop where I address the importance of the emotional and social topics in order to make of classrooms, brain based environments. People who have attended my 4 workshops, were highly interested in knowing more about this and were grateful for the information because the emotional background is extremely important and should be treated as a # 1 issue with all students. I talked about the ITI model of Susan Kovalik and also talked about Dr. Candace Pert’s discovery about the “molecules” an peptides of emotion. Thank you for the important message with this article! thanks for this. I would like to ask some examples of strategies to be used in classroom particularly in Biology. I mean activities to be used using brain based in teaching parts and functions of the cell. please I need your help. thank you so much.